The new Beltronics PRO-500 has all the features of the high performance PRO-300 but adds an internal GPS antenna for red light camera and fixed camera protection. The Beltronics Pro500 is the new standard in total driving protection at a great price. It provides a perfect balance of long range warning against conventional radar and laser guns but adds a database of safety cameras, and elimination of the number one complaint of radar detectors users - false alarms. i'm very satisfied with my P500. it does everything and more !! This one replaced a RX65 unit that got stolen from my car while it was being repaired, and I have to admit I trust it a lot more due to the better non-falsing capabilities from the previous one (which already had excellent non-alert features). So far, I am pleased! 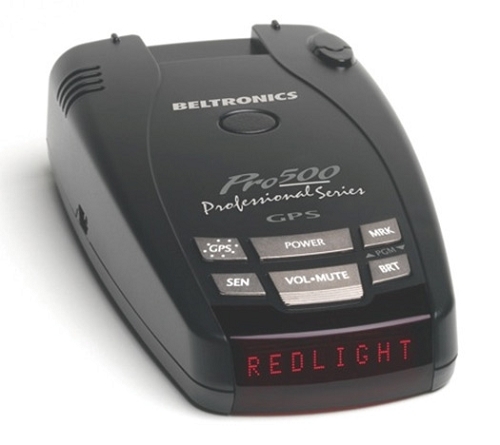 I upgraded from a Bel RX 65 (whch is a great radar detector) to the Beltonics PRO-500. I like the GPS / Red Light Warning features and it seems to work well. However, I'm not 100% positive that the detection range on this unit is as good as my RX65. I have not tested the two units side by side but I am just basing this observation on my daily drive experience back and forth to work. I do like the Bel 500 and look forward to many years of service. I am really happy with my Beltronics PRO-500 it is a excellent unit , the best part is locking out false alarms due to GPS capability , this is by far the best radar detector on the market , highly recommended . I used to own the RX 65 which was good but this one is much better , the range seems to be longer too.